A visitor to this web page inquired if I was suggesting that the public should have unrestricted access to Defence estates. I had to point out that this is a Garden. Even the alien rulers for whom ( after 1857) there was a clear and present danger, did not block out the view through high walls. Cantonments even for the East India Company were not exclusively for the use of the East India Company Army. The great distance of Army bases from the Borders is what led to the creation of the Border Security Force in December 1965*. It is worth noting here that the Hon'ble company swept in as conquerors but very slowly over decades. Europeans not just British were already employed in the armies of most Rajahs and Mahrajahs. The graveyard at Sardhana has Graves of Portugese, Poles, and Italians. Walter Rhinehardt (of Sardhana fame buried in Agra ) was from Luxemburg. * This was 1 year after Pandit Nehru's passing away. This could never have happened during his lifetime. He and the other leading lights of the time were aware of the change of purpose for the Army after Independence. The Cricket field - Many come for a walk or a run early in the morning to this ground. If you are here at around 5:30am (Summers) you can even here a bugle wake-up call. 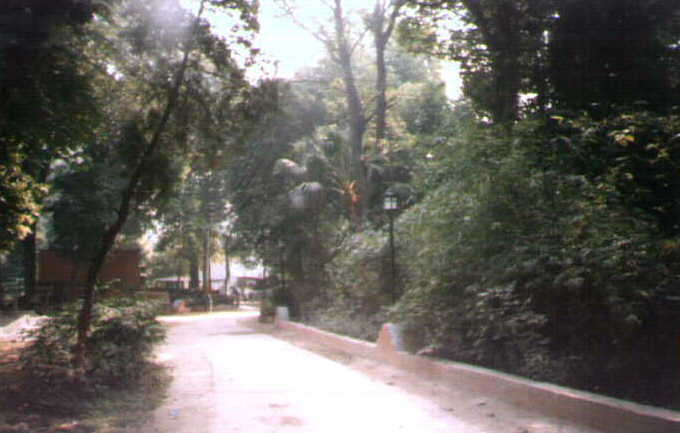 It is a replication of the past when about 200 years ago ( around 1803 ) this area came under British rule. The rule books also still use East India Company regulations(!!). To understand why the East India Company needed an army, one must appreciate the fact that most production was land based, to procure land (or the revenue it generated) the army was necessary. There is another strange thing - very often some very pedestrian British construction is classified as Heritage .. That is incorrect. Colonialism was largely an economic exercise. The British evacuated within a few years of granting independence. The Moghuls on the other hand made India their home forever. Can we ever recover from Colonialism ? My two bits - NEVER! An ideal place to break the journey to Mussoorie, and stretch your legs. Unfortunately there is no place for refreshments or snacks within. ( There is now .) This is the place for early morning walks. There is a little of old India still left here. Strangers will greet strangers with "Ram Ram" . Afterwards it can be " Jai Mata ki" " Mata ka Ashirwad ho" or " Om Nama Shivaye". A group of retired people comes here and fill the place with loud laughter, they also sing the word "OM" in harmony. 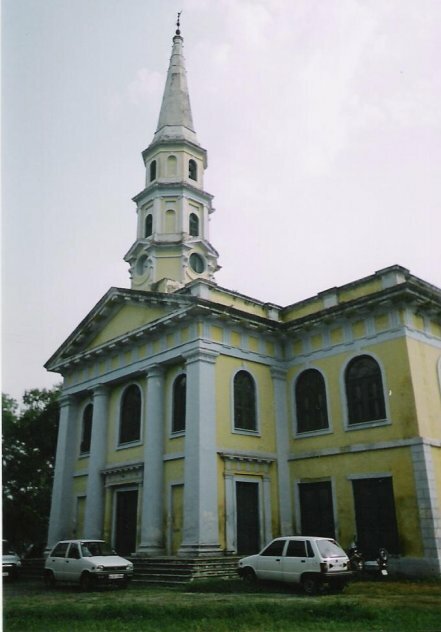 This is the St. John's Garrison Church. Here it is possible to see the service and burial registers , kept in good state . These date back from the construction of the church in 1819. Maybe a building of some importance even to non-Meerut residents. 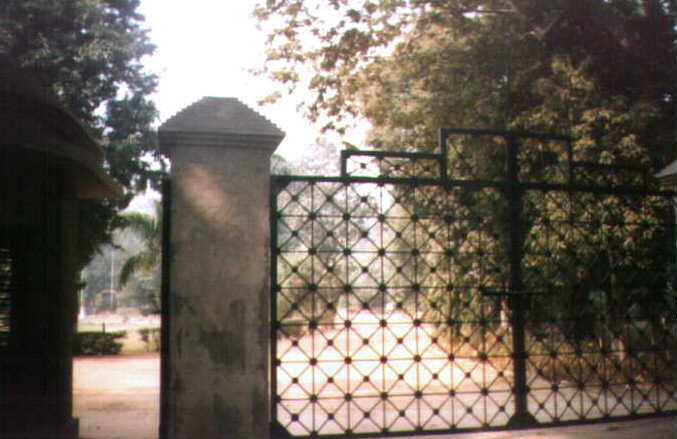 Meerut is one of the bigger Indian Cantonments. Sometimes British citizens come to look at registers to locate the graves of their ancestors . Their's not to reason why, their's but to do and die..
and men of "C" Squadron. 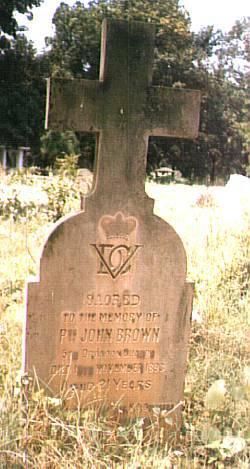 Pte John Brown Died of a Cholera Epidemic in 1893. Now add to this the fact that the lower ranks were sent to India very often as a punishment - as witnessed by frantic letters to the Chaplain of St. John's Church by parents of young conscripts - and the pathos of the whole thing is heart wrenching. Who won ? Below some of the older graves in the cemetery behind St. John's Church . These monumental ones are pre 1857. That is when the army belonged to the East India Company .Note: very few actual casualties of action are buried here . For them memorials have been erected. There were no Railways, not even cycles at that time. It could take an entire day to go from here to Delhi. The tall column marks the memorial of a certain General/Colonel?? Gillespie . He is famous in the Indian army.I have not been able to discover the reason why, but as a child I remember a poem mention his name. Maybe he was famous for being Gillespie.The inscription says Sir R.R Gillespie. 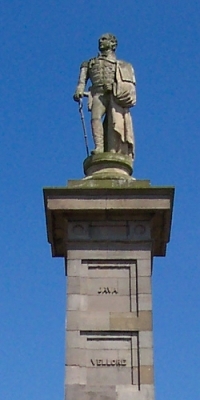 The picture on the right was sent by Mr. Johnston Walker an ex-resident of Meerut, the monument is in the town square of Comber North Ireland. 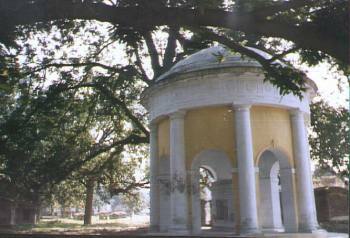 The names on the pedestal include Kalunga, Java, Vellore. Click here to view more information about Gillespie.The grave in the left middle foreground has some interesting associations. 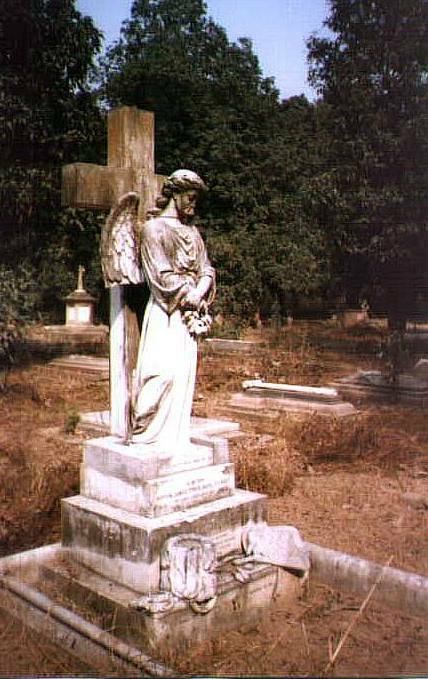 It is the grave of a lady - Elizabeth Donkin - after whom Port Elizabeth in South Africa is named. 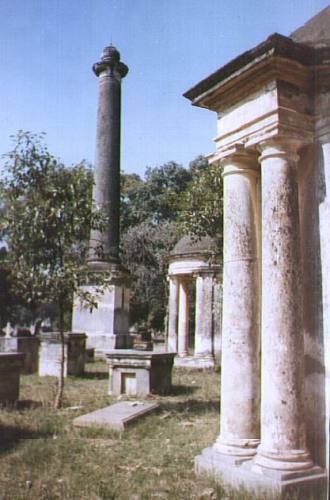 The Port Elizabeth History society discovered that the grave could be in the Meerut Cemetery and contacted the St. John's Church for details. The grave of an Ochterlony ( something to do with Nepal Wars ) whose column ( now called Shahid Minar ) is a major Landmark in the maidan at Calcutta is also here. William Dalrymple's recent book "The White Mughals" has a lot of material about Octerlony. When we come across youth with put on British / American accents , it is good to remember it was not all one way traffic. Ochterlony was most comfortable with the Indian way of life and mixed with westerners only on sufferance. The East India Company , operated from the INDIA OFFICE in London with the full blessings / convivance of the British Crown. These days they would be labelled as Drug pedlars . They grew Opium in Bengal and eastern UP, which they sold to the Chinese , then bought Chinese tea which they sold to the US ( yes the Tea of the Boston Tea Party, came from them )* . The Chinese thought sale of opium was illegal so in 1829 they confiscated a consignment and burnt it . This sparked off the "Opium wars" against the Chinese . When they won the wars they also wangled the rights to Hong Kong which went back to China recently. Tea was not grown in India until a certain Mr.Robert Fortune stole some tea plants from China and started tea plantations in India. I understand that the India Office in London has miles of shelves lined with records of the East India Company . Beats any Multinational I know of . They even sent the missionaries to pray for the Chinese addicted to Opium. No history book would tell you these things - but the Internet can . All that is mentioned here can be checked out if you find it unbelievable. Ho-Hum you say . Well those who feel that this is historical non sense and has nothing to do with the present day would do well to click here. Even today we are using laws lifted verbatim from the East India Company Rule Book. Needless to say the memory of the company is actively preserved only in India and not in the country of its origin. The whole despicable scheme known only to the India House inmates perhaps , would have looked like this . Use the army to get land to grow Opium, to sell to the Chinese for tea, sell respectable tea to the colonists and Europeans. As the Opium 'trade' decayed, the battles stopped - after 1858 there were none*. When the crown only looked for associations with princely states. How much Opium ? 5000 barrels per year. This was and is something which is sold in grammes.Read an article in the statesman referring to the Opium Wars Opium was quite central to British Colonization - how else would you explain at least 20 years of wars in which they 'won' Hongkong. Search the net for 'Opium Wars' for some very interesting material. One of them says 'Was the Queen of England Pushing Dope ?'. What was 'trade' to the British then was crime to the Chinese, and now to the whole world . By the way some very well known British poets were Opium addicts. ( Source Kingfisher's illustrated history of the World - pg. 503 ). * Another reason is that a large part of a East India Company's Army income came from loot and plunder. * Tea grown in America was taxed so that British Tea would have an edge .They did the same sort of thing in India when they taxed Indian salt, remember Gandhi's Dandi March . When they imported cotton from England they would not 'permit' Indian Cotton mills to be setup. For the nation of shop keepers, business always came first and they made sure their 'administration' served those ends. God bless us all - that system meant for imperceptible exploitation is being used now, courtesy loyal Babus, for governance. However the subterfuge is now quite obvious. You may now understand why so many permissions are required in India. It was a business ploy, to permit European Entrpreneurs and obstruct Indian ones. There was an exit hatch to the rules which allowed the administrator to use his own 'conscience' - profitably perhaps. Things started improving only after British trained officials retired.